The Maha Samaya Sutta is often chanted as a daily practice in Pali — and often at weddings and dedications of new buildings — and is considered a “protective blessing” as much as it teaches doctrine. The core message, though, is to emphasize the importance of refuge. Mara’s (demon) army, representing a personification of fear and lust, surrounds the “Great Meeting” to attack, but leaves “without even raising a hair on their bodies.” Why? Because, the gathering “listened to the Awakened One” — teaching that the words of the Buddha (Dharma) is refuge from fear. Although a part of the Pali Canon — and a very ancient sutta — some rationalists put this great Sutra into the category of “Buddhist folklore” because it contains a veritable “Who’s Who of the ancient Vedic gods. But to do so is to lightly dismiss its importance as a teaching. The “devas” serve as backdrop and framing, and even “attend” the teaching — but this is to punctuate the importance of the core message. The main doctrinal message of this Sutta is refuge. The long tribute at the beginning, listing all the great gods of the time, set to frame the importance of not taking refuge in gods — but rather in the Buddha, Dharma and Sangha. Those who have gone to the Buddha for refuge Will not go to the plane of woe. Interestingly, in this Pali sutra, Buddha expresses the belief in the power of mantras and their use. Although, typically, mantra is associated with Mahayana and Vajrayana, this is clear evidence that the ancient Pali Canon also mentioned the use of mantra. Mara the evil, the tempter, often comes into dreams or meditations to challenge meditators. Mara assailed Shakyamuni Buddha under the Bodhi tree prior to his Enlightenment. Here, in The Great Meeting Sutra, Mara assails the followers of Buddha at the Great Meeting with his army. The use of “folklore” and deities of the day can be thought of as symbolic, or “real”, but in either case the supernatural aspects aren’t that important. Buddha often dismissed “devas” (gods and goddesses) as not important to the spiritual path. It is often said one can believe in “gods” of any faith, and still practice Buddhism. Yet they are often featured in Sutras in this context (as students there to learn from the Awakened One) to help punctuate the importance of Enlightenment for all classes of being from low to high. Still, this sutra begs the question, if Buddha felt the devas were not important to Buddhist spiritual practice, why does “The Great Meeting” exhaustively list them all? As with any argument or statement, context is needed. The Who’s Who of devas is important context to the core message that ultimately, refuge in Buddha, Dharma, Sangha are the path to Enlightenment. Even devas themselves must seek refuge if they hope for Enlightenment. That attachments and clinging are the causes of fear and warfare, strife and suffering. These “magical” or “supernatural” aspects aren’t the message of the Buddha. They follow the traditional style of teachings in the days of Buddha: beginning with an exhaustive list of attendees, and serve to illustrate that all classes of beings, from Devas to lowly, can benefit from the teachings. A great meeting in the woods: The deva hosts have assembled. We have come to this Dhamma meeting To see the invincible Sangha. The Bhikkhus there are concentrated, Have straightened their own minds. Like a charioteer holding the reins, The wise ones guard their faculties. Having cut through barrenness, cut the crossbar, Having uprooted Indra’s pillar, unstirred, They wander about pure, unstained, Young nagas well tamed by the One with Vision. Those who have gone to the Buddha for refuge Will not go to the plane of woe. On discarding the human body, They will fill the hosts of the devas. I recite a verse of tribute. Those who live where spirits dwell, who live in mountain caves, resolute, concentrated, many, like hidden lions, who have overcome horripilation, white-hearted, pure, serene, and undisturbed: Knowing that more than 500 of them had come to the forest of Kapilavatthu, the Teacher then said to them, disciples delighting in his instruction, “The deva hosts have approached. Detect them, monks!” Listening to the Awakened One’s instruction, they made a diligent effort. Knowledge appeared to them, vision of non-human beings. Some saw 100, some 1,000, some 70,000, some had vision of 100,000 non-human beings. Some gained vision of innumerable devas filling every direction. Realizing all this, the One-with-Vision felt moved to speak. The Teacher then said to them, disciples delighting in his instruction, “The deva hosts have approached. Detect them, monks, as I describe their glories, one by one. 7,000 yakkhas inhabiting the land of Kapilavatthu, powerful, effulgent, glamorous, prestigious, rejoicing, have approached the monks’ forest meeting. 6,000 yakhas from the Himalayas, of varied hue, powerful, effulgent, glamorous, prestigious, rejoicing, have approached the monks’ forest meeting. From Mount Sata 3,000 yakkhas of varied hue, powerful, effulgent, glamorous, prestigious, rejoicing, have approached the monks’ forest meeting. These 16,000 yakkhas of varied hue powerful, effulgent, glamorous, prestigious, rejoicing, have approached the monks’ forest meeting. 500 yakkhas from Vessamitta, of varied hue, powerful, effulgent, glamorous, prestigious, rejoicing, have approached the monks’ forest meeting. Kumbhira from Rajagaha, who dwells on Mount Vepulla, accompanied by more than 100,000 yakkhas — Kumbhira from Rajagaha: He, too, has come to the forest meeting. And Dhatarattha, who rules as king of the Eastern Direction, as lord of the gandhabbas: A glorious, great king is he, and many are his sons named Indra, of great strength. Powerful, effulgent, glamorous, prestigious, rejoicing, they have approached the monks’ forest meeting. And Virulha, who rules as king of the Southern Direction, as lord of the kumbandas: A glorious, great king is he, and many are his sons named Indra, of great strength. Powerful, effulgent, glamorous, prestigious, rejoicing, they have approached the monks’ forest meeting. And Virupakkha, who rules as king of the Western Direction, as lord of the nagas: A glorious, great king is he, and many are his sons named Indra, of great strength. Powerful, effulgent, glamorous, prestigious, rejoicing, they have approached the monks’ forest meeting. And Kuvera, who rules as king of the Northern Direction, as lord of the yakkhas: A glorious, great king is he, and many are his sons named Indra, of great strength. Powerful, effulgent, glamorous, prestigious, rejoicing, they have approached the monks’ forest meeting. Dhatarattha from the Eastern Direction, Virulhaka from the South, Virupakkha from the West, Kuvera from the Northern Direction: These four Great Kings encompassing the four directions, resplendent, stand in the Kapilavatthu forest. Their deceitful vassals have also come — deceptive, treacherous — Maya, Kutendu, vetendu, Vitu with Vituta, Candana, the Chief of Sensual Pleasure, Kinnughandu, Nighandu, Panada, the Mimic, Matali, the deva’s charioteer, Cittasena the gandhabba, King Nala, the Bull of the People, Pañcasikha has come with Timbaru and his daughter, Suriyavacchasa. These and other kings, gandhabbas with their kings, rejoicing, have approached the monks’ forest meeting. 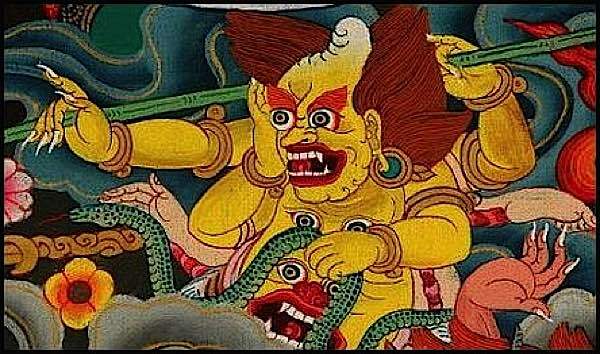 Then there have also come nagas from Lake Nabhasa, Vesali, and Tacchaka. Kambalas, Assataras, Payagas, and their kin. They who swoop down swiftly on naga kings, divine, twice born, winged, their eyesight pure: (Garudas) came from the sky to the midst of the forest. Citra and Supanna are their names. But the Buddha made the naga kings safe, made them secure from Supanna. Addressing one another with affectionate words, the nagas and Supannas made the Buddha their refuge. Devas of water, earth, fire, and wind have come here. Varunas, Varunas, Soma together with Yasa, the prestigious devas of the hosts of goodwill and compassion have come. These ten ten-fold hosts, all of varied hue, powerful, effulgent, glamorous, prestigious, rejoicing, have approached the monks’ forest meeting. Vendu (Visnu) and Sahali, Asama and the Yama twins, the devas dependent on the moon surrounding the moon have come. The devas dependent on the sun surrounding the sun have come. Devas surrounding the zodiac stars and the sprites of the clouds have come. Sakka, chief of the Vasus, the ancient donor, has come. These ten ten-fold hosts, all of varied hue, powerful, effulgent, glamorous, prestigious, rejoicing, have approached the monks’ forest meeting. Then come the Sahabhu devas, blazing like crests of fire-flame. The Arittakas, Rojas, cornflower blue. Varunas and Sahadhammas, Accutas and Anejakas, Suleyyas and Ruciras, and Vasavanesis have come. These ten ten-fold hosts, all of varied hue, powerful, effulgent, glamorous, prestigious, rejoicing, have approached the monks’ forest meeting. Samanas and Great Samanas, Manusas and Super Manusas, the devas corrupted by fun have come, as well as devas corrupted by mind. Then come green-gold devas and those wearing red. Paragas and Great Paragas, prestigious devas have come. These ten ten-fold hosts, all of varied hue, powerful, effulgent, glamorous, prestigious, rejoicing, have approached the monks’ forest meeting. White devas, ruddy-green devas, dawn-devas have come with the Veghanas headed by devas totally in white. The Vicakkhanas have come. Sadamatta, Haragajas, and the prestigious multi-coloreds, Pajunna, the thunderer, who brings rain to all lands: These ten ten-fold hosts, all of varied hue, powerful, effulgent, glamorous, prestigious, rejoicing, have approached the monks’ forest meeting. The Khemiyas, Tusitas, and Yamas, the prestigious Katthakas, Lambitakas, and Lama chiefs, the Jotinamas and Asavas, the Nimmanaratis have come, as have the Paranimmitas. These ten ten-fold hosts, all of varied hue, powerful, effulgent, glamorous, prestigious, rejoicing, have approached the monks’ forest meeting. When all these devas with Indras and Brahmas had come, Mara came as well. Now look at the Dark One’s foolishness! “Mara’s army has approached. Detect them, monks!” Listening to the Awakened One’s instruction, they made a diligent effort. The army retreated from those without passion, without raising even a hair on their bodies. Having all won the battle — prestigious, past fear — they rejoice with all beings: Disciples outstanding among the human race. [Evam-me sutaa.] Ekaa samayaa Bhagav›, Sakkesu viharati Kapilavatthusmia Mah›vane, mahat› bhikkhu-saoghena saddhia pañca-mattehi bhikkhu-satehi sabbeheva arahantehi. Dasahi ca loka-dh›tÒhi devat› yebhuyyena sannipatit› honti Bhagavantaa dassan›ya bhikkhu-saoghañca. I have heard that on one occasion the Blessed One was dwelling among the Sakyans at Kapilavatthu in the Great Wood, together with a large Sangha of approximately five hundred bhikkhus, all of them arahants. And most of the devat›s from ten world-systems had gathered in order to see the Blessed One & the Bhikkhu Sangha. mahat› bhikkhu-saoghena saddhia pañca-mattehi bhikkhu-satehi sabbeheva arahantehi. evam-eva suddh›v›sesu devesu antarahit› Bhagavato purato p›turahaasu. Atha kho t› devat› Bhagavantaa abhiv›detv› ekam-antaa a ̨ ̨haasu. Ekam-antaa ̨hit› kho ek› devat› Bhagavato santike imaa g›thaa abh›si. Mah›-samayo pavanasmia Deva-k›y› sam›gat› figatamha imaa dhamma-samayaa Dakkhit›yeva apar›jita-saoghanti. Atha kho apar› devat› Bhagavato santike imaa g›thaa abh›si. S›rathı va nett›ni gahetv› Indriy›ni rakkhanti pa ̊ ̃it›ti. Pah›ya m›nusaa dehaa Deva-k›yaa paripÒressantıti. “Those who have gone to the Buddha for refuge will not go to the plane of woe. Atha kho Bhagav› bhikkhÒ ›mantesi, “Yebhuyyena bhikkhave dasasu loka-dh›tÒsu devat› sannipatit› honti Tath›gataa dassan›ya bhikkhu- saoghañca. tesam-pi Bhagavant›naa eta-param›yeva devat› sannipatit› ahesua, seyyath›-pi mayhaa etarahi. tesam-pi Bhagavant›naa eta-param›yeva devat› sannipatit› bhavissanti, seyyath›-pi mayhaa etarahi. Then the Blessed One addressed the monks: “Monks, most of the devat›s from ten world-systems have gathered in order to see the Tath›gata & the Bhikkhu Sangha. Those who, in the past, were Pure Ones, Rightly Self- awakened, at most had their devat›-gathering like mine at the present. Those who, in the future, will be Pure Ones, Rightly Self-awakened, will at most have their devat›-gathering like mine at the present. ficikkhiss›mi bhikkhave deva-k›y›naa n›m›ni. Kittayiss›mi bhikkhave deva-k›y›naa n›m›ni. Desiss›mi bhikkhave deva-k›y›naa n›m›ni. “Evam-bhanteti” kho te bhikkhÒ Bhagavato paccassosua. Bhagav› etad-avoca. they made an ardent effort. “The deva hosts have approached. Detect them, monks, as I describe their glories, one by one. Bhumm› K›pilavatthav› Va ̊ ̊avanto yasassino BhikkhÒnaa samitia vanaa. 7,000 yakkhas inhabiting the land of K›pilavastu, powerful, effulgent, glamorous, prestigious, rejoicing, have approached the monks’ forest meeting. Yakkh› n›natta-va ̊ ̊ino Va ̊ ̊avanto yasassino BhikkhÒnaa samitia vanaa. 6,000 yakkhas from the Him›layas, of varied hue, powerful, effulgent, glamorous, prestigious, rejoicing, have approached the monks’ forest meeting. From Mount S›ta 3,000 yakkhas of varied hue, powerful, effulgent, glamorous, prestigious, rejoicing, have approached the monks’ forest meeting. powerful, effulgent, glamorous, prestigious, rejoicing, have approached the monks’ forest meeting. 500 yakkhas from Vess›mitta, of varied hue, powerful, effulgent, glamorous, prestigious, rejoicing, have approached the monks’ forest meeting. Dhatara ̨ ̨ho pas›sati Mah›r›j› yasassi so Inda-n›m› mahabbal› Va ̊ ̊avanto yasassino BhikkhÒnaa samitia vanaa. rejoicing, they have approached the monks’ forest meeting. VirÒ ̆ho tappas›sati Mah›r›j› yasassi so Inda-n›m› mahabbal› Va ̊ ̊avanto yasassino BhikkhÒnaa samitia vanaa. VirÒpakkho pas›sati Mah›r›j› yasassi so Inda-n›m› mahabbal› Va ̊ ̊avanto yasassino BhikkhÒnaa samitia vanaa. Modam›n› abhikk›mua BhikkhÒnaa samitia vanaa. These four Great Kings encompassing the four directions, resplendent, stand in the K›pilavastu forest. TimbarÒ Suriyavacchas› Gandhabb› saha r›jubhi BhikkhÒnaa samitia vanaa. with Timbaru [and his daughter,] Suriyavacchas›. These & other kings, gandhabbas with their kings, rejoicing, have approached the monks’ forest meeting. Ves›l› saha Tacchak› P›y›g› saha ñ›tibhi figÒ n›g› yasassino Sop’›ga samitia vanaa. divine, twice-born, winged, their eyesight pure: (Garu ̃as) came from the sky to the midst of the forest. Citra & Supa ̊ ̊a are their names. made them secure from Supa ̊ ̊a. the n›gas & Supa ̊ ̊as made the Buddha their refuge. Sabbe n›natta-va ̊ ̊ino Va ̊ ̊avanto yasassino BhikkhÒnaa samitia vanaa. of goodwill & compassion have come. The Ari ̨ ̨akas, Rojas, cornflower blue. The Vicakkha ̊as have come. rejoicing, have approached the monks’ forest meeting. When all these devas with Indras & Brahmas had come, M›ra’s army came as well. Now look at the Dark One’s foolishness! [He said:] “Come seize them! Bind them! Tie them down with passion! lightning, & torrents of rain. Te vij›n›tha bhikkhavo” Sutv› Buddhassa s›sanaa Nesaa lomam-pi iñjayua Bhay›tıt› yasassino S›vak› te janesut›ti. The army retreated from those without passion, without raising even a hair on their bodies.